Breathing Eden invites readers to listen to forty raw, honest, heartbreaking, and encouraging conversations between women and God, and to hear him whisper hope and peace in response. What must it have been like, walking in the garden, talking with God? What would it be like to share our troubles and joys openly with him, to breathe the fresh garden air, to see the light shining through the trees? What would it be like to hear his voice responding to our questions? How might knowing God's view on our stories heal our wounds and renew our hope? No matter our circumstances, we all need God's perspective on our lives. We need to know how he sees us. Come on, girl, he says. Let my light shine in. 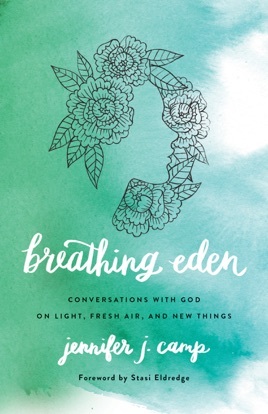 Breathing Eden is forty raw, honest, heartbreaking and encouraging conversations between women and God. These prayers are like our own: full of pain, celebration, anxiety, and joy. Each one helps the reader hear God whisper love and hope into their lives. And after each story, Jennifer offers readers a guided invitation to listen for what God is saying to them. In these pages, readers will find hope and fresh perspectives. It's an invitation to come. Breathe Eden.